Around the world, different regions celebrate holidays unique to their cultures. However, many share a similar interest in ringing in the new year with friends, family, and food. Among these various New Year’s celebrations, Iceland has one of the most festive. 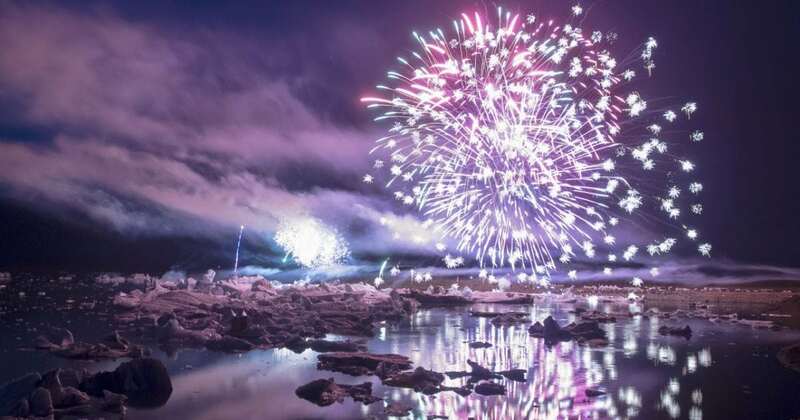 New Years Eve in Iceland is a splendid sight to behold. Residents of Iceland follow an hours-long cultural routine rooted in years-long tradition. 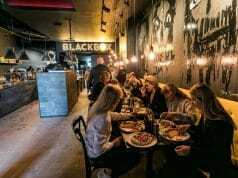 Icelanders gather with family and friends around 6 PM for dinner and drinks. After this, sometime around 8 PM, people start bonfires all across the nation. They then light fireworks and play music. Around 10:30, everybody heads inside to watch “Aramotaskaupid”: a popular TV program that has been running since the 1960s in Iceland. After the show, people go back out to celebrate, lighting more fireworks until the clock strikes midnight. After midnight, they celebrate by bar-hopping until the early hours of the morning. Traditions like these are rooted in having fun and enjoying everybody’s company. This is what makes New Year’s in Iceland such a special celebration for both locals and tourists. It reflects how welcoming of a country Iceland truly is. Dinner is the first thing on the agenda for New Year’s in Iceland. 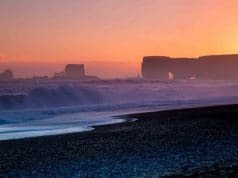 Planning on spending New Year’s Eve in Iceland? If so, you should try to make a timely reservation to the numerous restaurants or bars open for business at this hour. 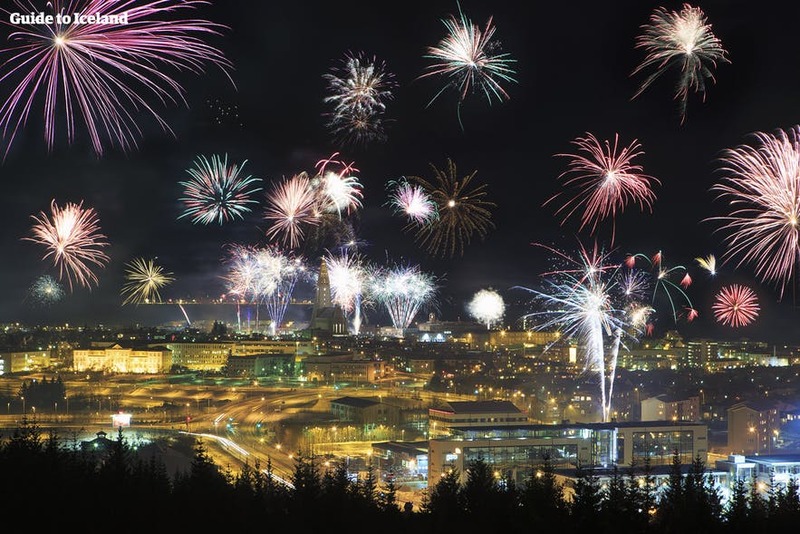 While most of this guide is focused on people touring Reykjavik, People in cities like Akureyri and Isafjordur have the same New Year’s customs. You can partake in some traditional dishes such as Hangikjot, a type of smoked lamb, mutton, or horse, served with peas and potatoes. Or, you can go for Ptarmigan, a kind of bird that is usually served with sweet potatoes and red cabbage. If you feel like trying a more familiar option, you can always get Smoked Ham glazed with mustard and brown sugar. After dinnertime, locals will start shooting off their veritable stockpile of fireworks. The sheer number of fireworks Icelanders set off is staggering. The people in Iceland spend lots of money on fireworks because the proceeds from the purchases (along with the sales of Christmas trees) help to fund the Icelandic Search and Rescue Teams. Yet another thing that makes New Years in Iceland spectacular. Not to mention how fun it is to set them all off! These teams work year-round in the country, and the New Year’s sales hugely benefit their operations. The certified fireworks vendors that do this are called Flugbjorgunarsveitin and Landsbjorg. When all the popping and whizzing subsides, you can head over to any of the 90 large bonfires being lit across the country by the Icelandic Search and Rescue Teams. They usually start around 8:00 PM, and are a place to gather with neighbors and family members. These bonfires are excellent shows of camaraderie within the community as everybody comes together to celebrate the New Year. Every area tends to have a slightly different approach to their bonfires. Some of them gather around the fire to sing songs; others like to dance. Many communities want to pick to pray and give thanks for all the good that happened during the passing year. The most popular bonfire is the one done by the locals on Aeissida. If you are lucky, you may catch a glimpse of the beautiful Northern Lights! Time to see the Aramotaskaupid! Aramotaskaupid is an Icelandic TV show broadcast every New Year’s Eve since the 1960s. It’s a skit comedy show wherein many actors and comics come together and mock anything and everything from the prior year. They may take shots at a politician, celebrity, or national event. Essentially everything good or bad in the news is not safe from Aramotaskaupid! In 2014 due to an increase in Icelandic tourism, they even poked fun at the entire nation of Iceland and its people, based on how the rest of the world perceives them. Over 90% of Iceland’s residents watch the show on New Year’s, so from 10:30 to 11:30 you would be hard pressed to find anybody walking in the street. In recent years, the show has grown in popularity, and its following now extends outside of Iceland, despite the broadcast being spoken in Icelandic. The clock striking midnight by no means signifies the end of the night for Icelanders. Almost every pub and bar in Reykjavik is open for business and will remain open until early morning. People around this time of night will often go out barhopping until very early morning. Tourists are more than welcome to join in on the festivities, as the locals are very welcoming. Not everybody will be bar hopping in Reykjavik, though. If you’d like a more formal celebration, you can book a reservation on some of the multiple gala parties offered in places like the Gamla Bio. If you are spending your time in Iceland’s beautiful countryside, be sure to look into the local customs. Some more rural areas don’t have much of a New Year’s party scene and have their new traditions, like dances and balls. If you’d like to participate in these customs, make sure to do your research! If you instead enjoy the sights from afar, there are many Fireworks cruises that you can book in advance to spend the New Year on the sea and watch the fireworks dance across the nighttime waters. Most of these tours take a couple of hours and then drop you off on land so you can continue to celebrate in other location. If your New Year’s plan includes an early arrival, you’ll probably get to see many cultural events taking place just before the final day of the year such as the Nordur & Nidur Festival, promoted by the local folk band, Sigur Ros. The 4-day event is loaded with many artists presenting their works, such as music, dancing, and visual arts. If indie rock music and pop art is not your thing you can choose to go the New Year’s concert offered by the Icelandic Symphony, they traditionally perform shows each year on three different days within the first week of the New Year. The End of the Road – Until Next Year! After a long night of partying, you can take the next day to visit one of the beautiful natural areas of the country to get a breath of fresh air. 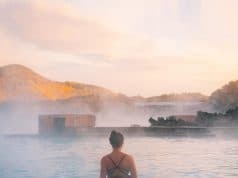 You can go to The Blue Lagoon or the Thermal pools of Reykjavik and take a long relaxing bath in the warm waters. If you’d like to unwind by being active, you can visit Diamond Beach or the Jokulsarlon lagoon to take a cold swim that will have you up and running in no time. 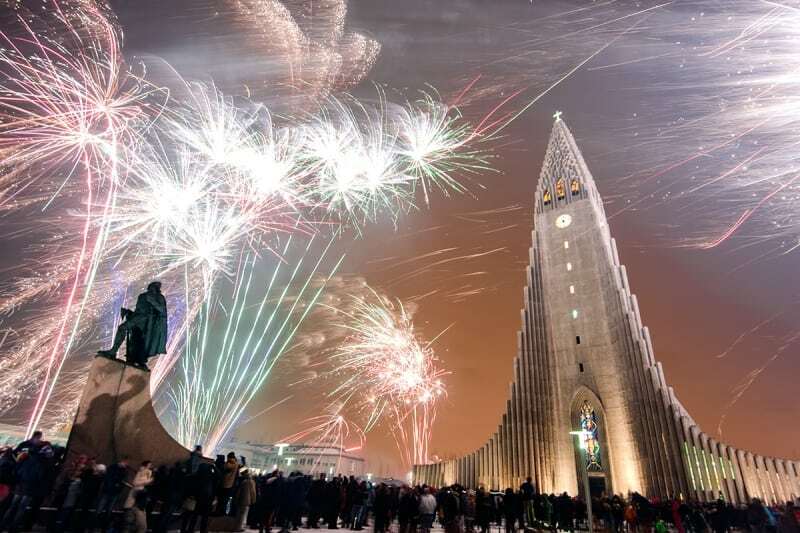 There are tons of things to do during New Year in Iceland. And the best part is, the residents have found ways to balance their bustling tourism industry with a commitment to age-old New Year’s traditions.